Heat canola oil in a large skillet over medium heat. Add the garlic, chili powder, chipotle, adobo sauce, cumin, and cayenne. Cook briefly until fragrant, about 30-60 seconds. Add in drained and rinsed beans, and water. Bring to a simmer, then lower heat to medium-low and cook for 8 minutes, mashing the bean mixture slightly. Remove from heat, and stir in rice and salsa. Divide mixture evenly down the center of each tortilla. 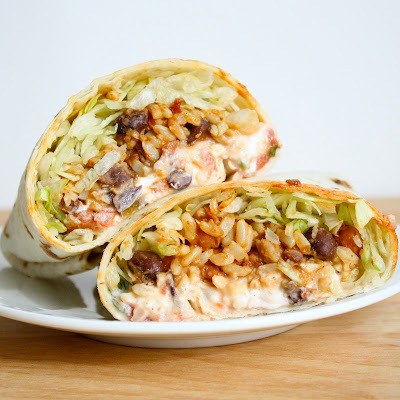 Top with cheese, lettuce, green onions, and Greek yogurt. Roll up, and serve!